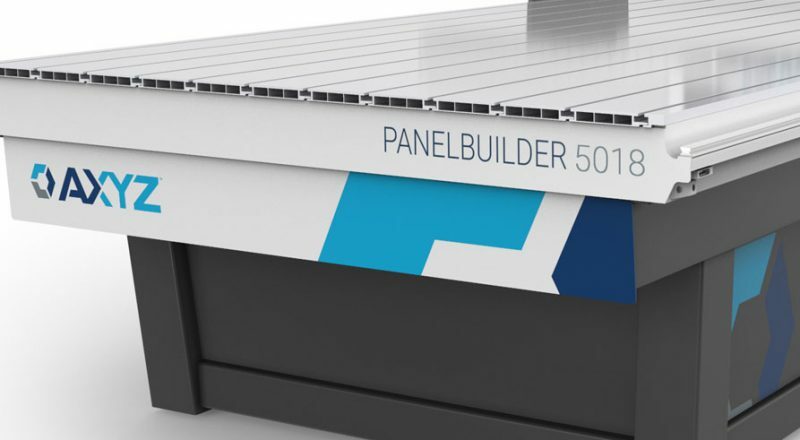 Widths from 60" to 103"
The new PANELBuilder system is designed specifically for the aluminum composite (ACM), metal composite market (MCM), High Pressure Laminate (HPL) and Fibre Cement Board markets. By combining an advanced, easy-to-use software solution with a custom machine design, the PANELBuilder system makes it possible to process ACM materials faster, more consistently and at a lower cost than ever before. 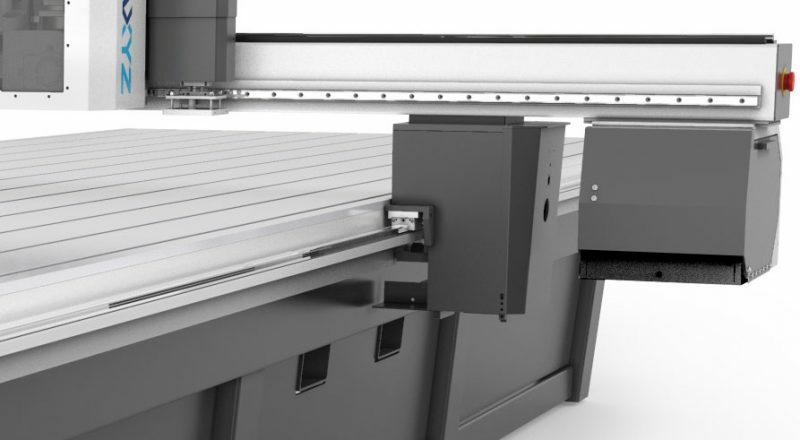 It incorporates a complete CAD/CAM solution with all the functionality needed for one-off or high volume panel production. Alternatively, thanks to its open architecture design, it can be used in conjunction with existing CAD systems to provide powerful and flexible nesting, automation and machine programming functionality. How can PANELBuilder help your business grow? This system is specifically engineered for aluminum composite and metal composite manufacturers processing large volumes of cladding materials in the fastest and most efficient way possible. PANELBuilder is designed to process all types of composite sheet materials such as Alucobond (Alcan Composites), Alpolic (Mitsubishi Chemical), Reynobond (Alcoa) and others. 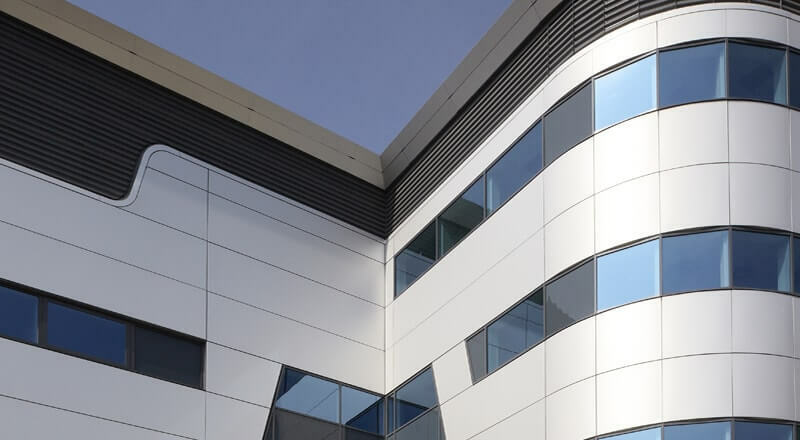 It is equally capable of working with other cladding materials such as stainless composite material, titanium, copper or zinc as well as solid aluminum and high-pressure laminates such as Trespa. The new PANELBuilder system is the most sophisticated all-in-one solution on the market. By combining an advanced, easy-to-use software solution with a custom machine design and new automated label printer (ALP), it’s now possible to process all types of cladding materials faster, more consistently and at a lower cost than ever before. A library of parametric templates for quick duplication and resizing in a few clicks. 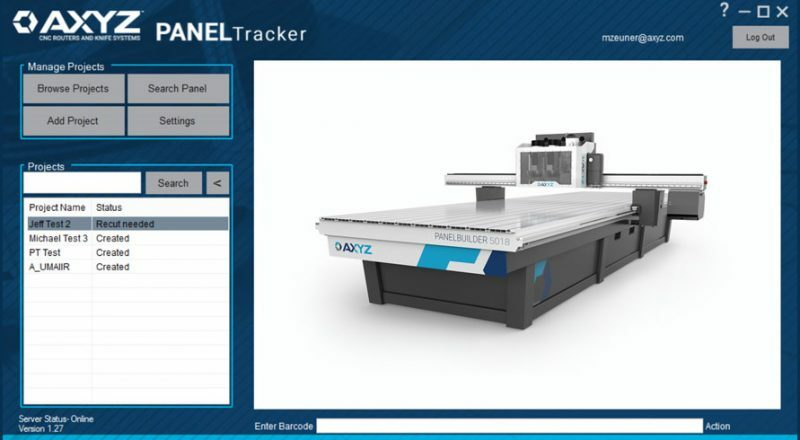 The AXYZ PANELBuilder CNC router is designed specifically for processing large volumes of ACM/MCM/HPL and Fibre Cement Board sheets in the fastest and most efficient way possible. The machine can be configured to suit your exact needs. Process areas can be selected from 60" (1,524mm) x 120" (3,048mm) to a massive 85" (2,159mm) x 478" (12,129mm) or even longer in increments of 24" (600mm), allowing one or more standard size sheets to be processed at once. 8", 10", 12", 13", 15", 18"
PANELBuilder uses the best technology money can buy. Offering a highly specified standard configuration PANELBuilder is designed exclusively for the cladding industry. Choose from standard or helical racks for your choice of productivity and precision. All Z axes feature a precision ballscrew drive as standard. Based on the most customizable machine base in the industry, PANELBuilder is adaptable to meet any unique business needs. Optional enhancements such as PANELTracker, Automated Label Printer and Nose Rider have proven particularly popular in the cladding industry. The most efficient way to manufacture panels is to keep the machine cutting at all times. This is easily achieved using the PANELBuilder ‘Pendulum Processing’ feature. This allows the machine bed to be split into 2 virtual zones so that a sheet can be processed on one zone while the operator removes the parts and waste from the other zone and a new sheet loaded ready to be cut. Automatic switching of the vacuum hold down and material locating pins are fully integrated for seamless, continuous production. The Nose Rider Collar is an AXYZ exclusive machine accessory. Some applications require a very exact depth of cut into the materials, especially for processes that rely on consistent depths for accuracy. Used in conjunction with the high capacity pressure foot, the Nose Rider collar ensures the cutting tool will only protrude through the bottom of the foot for the exact depth required for consistent cutting. Pneumatically operated steel pop-up pins are useful for ensuring repeatable material placement. The number and positioning of the pins is fully customizable. 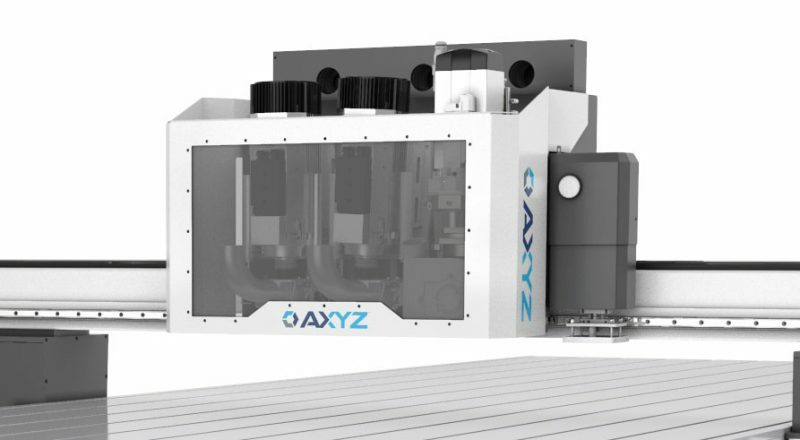 The High Capacity chip extraction foot is a vital component of your AXYZ CNC Router. The pressure foot is specially designed for optimal chip extraction as well as assisting with material stability for high quality of cut. The vacuum manifold is available for twin and triple head configurations. It contains fully automatic valves for switching suction to the currently active head. Waste extraction is extremely efficient and reduces the need for manual debris removal. The ACM Chip Collection System included a regenerative blower as a vacuum source, along with a stainless steel can to collect your chips. The optional Automated Label Printer accessory is a fast and accurate method of panel identification. Comes with standard or user-definable label locations, templates and defined label generation. Designed for high speed straight line processing of a wide range of materials including Composites, High Pressure Laminates and Fibre Cement Board. Optional management reporting app for tracking the progress of projects and managing recutting of damaged panels.